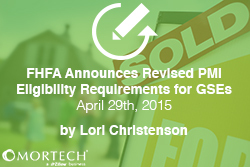 The Federal Housing Finance Agency (FHFA) has announced a clear a comprehensive set of standards for private mortgage insurance companies issued by Fannie Mae and Freddie Mac. These requirements go into effect December 31, 2015 for existing approved insurers and immediately for new applicants. The updated Private Mortgage Insurer Eligibility Requirements (PMIERs) will be put in place in order to lower the risk for the enterprises and ensure private mortgage insurers will be able to weather an economic downturn. underwriting guidelines must be applied consistently to each borrower. Fannie Mae and Freddie Mac have both provided additional resources for the updated standards including FAQs and an Implementation Timeline available on their websites. We look at industry happenings and updates every week.